Bearing demand in the US will increase 4.4 percent per year to $12.9 billion in 2017, a notable improvement from the 2007-2012 period. Roller bearing demand is expected to continue to outpace other product types, supported by motor vehicle, machinery and wind turbine markets. Ball bearing consumption will also post healthy gains, supported by increasing manufacturing output. 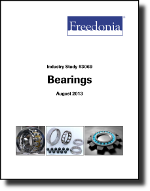 This study analyzes the $10.4 billion US bearing industry. It presents historical demand data for 2002, 2007 and 2012, and forecasts for 2017 and 2022 by product (e.g., ball bearings, roller bearings, plain bearings, mounted bearings) and market (e.g., motor vehicles; machinery; aerospace equipment; engines, turbines and power transmission equipment; construction, mining and oilfield machinery; material handling equipment; MRO). The study also considers market environment factors, details industry structure, evaluates company market share and profiles 33 industry players, including Timken, SKF, and Schaeffler.